Ending the confusion that Rheumatoid Disease is a type of arthritis. What if no one confused rheumatoid disease with just arthritis? What if the world understood that people with rheumatoid disease (RD) are not hypochondriacs because they have so many health problems? What if all of the effects of the disease were treated – and not dismissed or ignored? Rheumatoid Arthritis Unmasked documents extra-articular disease through medical literature. The facts in Rheumatoid Arthritis Unmasked shatter the myth that rheumatoid disease is just a type of arthritis. 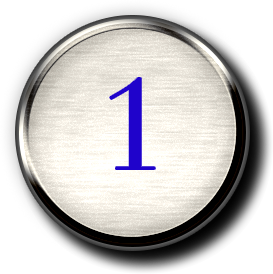 You will learn 10 key dangers that prove the historical term rheumatoid disease (RD) describes a complex systemic disease with arthritis as only one of its symptoms. Patients will be armed to fight against becoming a victim of the RD mortality gap. Doctors will know how to better diagnose and treat RD. Friends and family will understand that a loved one with RD has a serious disease. Like most people diagnosed with rheumatoid arthritis (RA), Kelly had no idea what she was in for. When years of suspicious symptoms turned into full-blown RA in 2006, her life changed in an instant. Instead of the strength and wellbeing she had cherished, she faced severe joint pain and endless battles with her health. The struggles were made worse by the reactions of loved ones and neighbors who dismissed RA as a minor concern to be cured with Tylenol. Sometimes even doctors didn’t get it. She felt her symptoms were ignored, or worse yet doubted, at every turn. She felt alone because she didn’t know anyone else like her. Even though her own grandfather had had RA, she realized now that she knew nothing of what he went through. 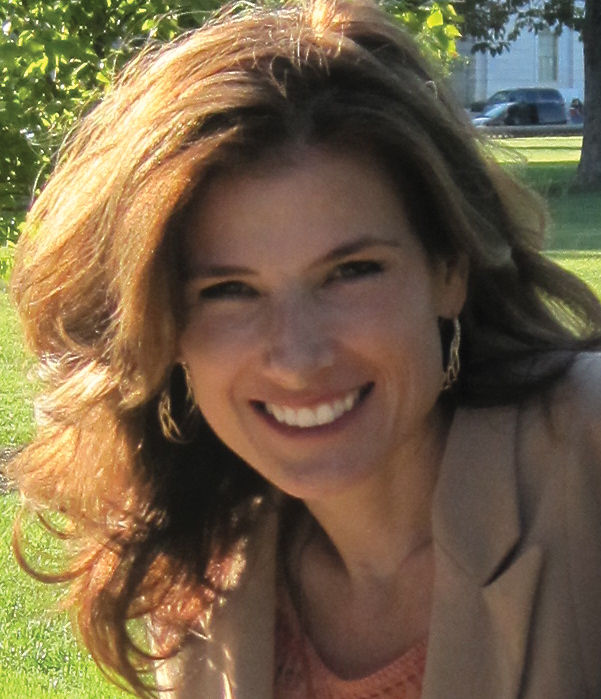 Like so many patients in the digital age, Kelly began to research her disease. And like many, she got to know other patients through social media and her blog. Over the years as she continued to study and her community grew, she began to see first-hand the bigger picture of RA as a disease – a disease that harms people and cuts lives short. It was unmistakable: rheumatoid arthritis (RA) is actually rheumatoid disease (RD). Kelly had to share what she learned. She realized writing this book had to come before other projects or books she wanted to finish. Rheumatoid Arthritis Unmasked tackles the one topic that can address both the persistent minimizing of the disease and its tragic mortality gap. 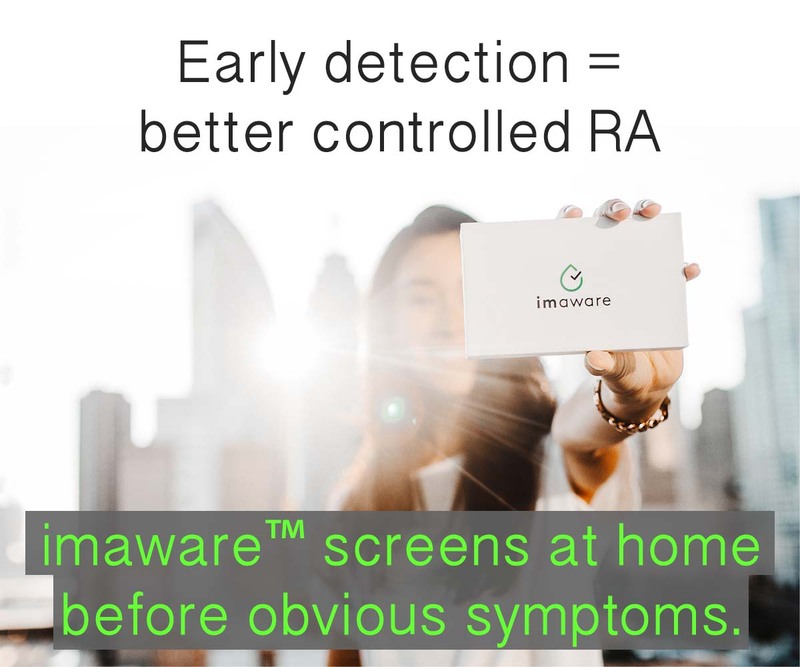 Rheumatoid Arthritis Unmasked solves a primary problem for people living with rheumatoid arthritis (RA), the false impression that they are only fighting a type of arthritis. You’ll understand how the fallacy of “arthritis” not only creates communication problems for people fighting RD, but also contributes to the devastating mortality gap by hindering needed clinical care and research that will lead to a cure. 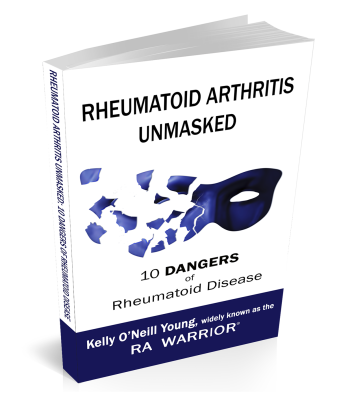 Rheumatoid Arthritis Unmasked exposes the true nature of RD revealed in medical research. 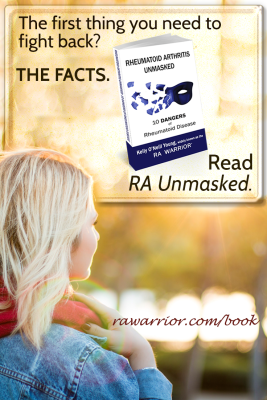 Rheumatoid Arthritis Unmasked is more than a gripping account of the dangers of RD – it is a path for change. 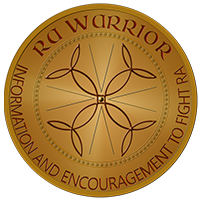 This book equips all RA warriors to guide their own medical care and safeguard their health. This book will arm you with facts that will save lives. You are guaranteed the lowest price. Any sale at Amazon during this pre-order period will apply to your purchase – even if it’s after your purchase! Amazon ensures everyone who pre-ordered before their sale will also get the lowest price when the book is released. Kelly O’Neill Young is an award-winning speaker, writer, and funny girl who inspires and equips people to live their best lives despite chronic illness. She is passionate about helping others and working to bridge knowledge gaps between patients, the public, and the medical community. Widely known as the RA Warrior, Kelly became a patient expert through a decade of studying academic research while interacting with patients. 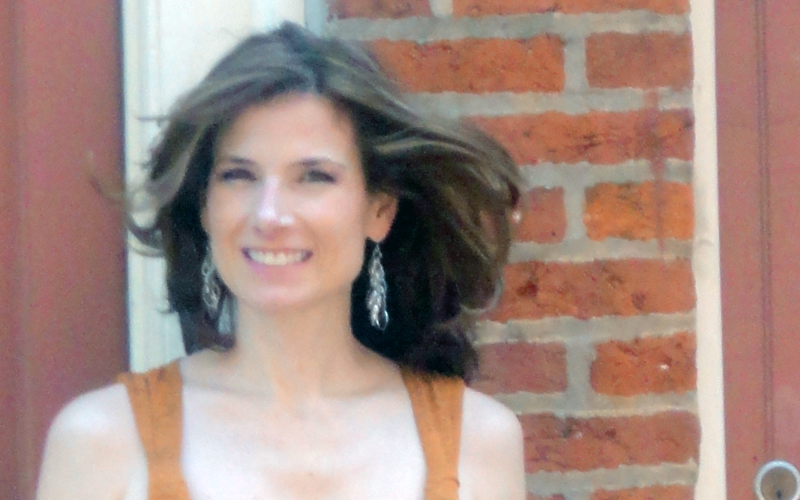 She has written over 1,000 articles on RA, healthcare, and overcoming adversity. She has made numerous contributions to research, government, and industry. 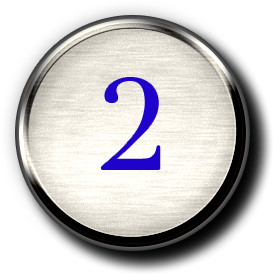 Kelly founded the first non-profit for RA in the U.S., the Rheumatoid Patient Foundation, and established February 2nd as Rheumatoid Awareness Day. 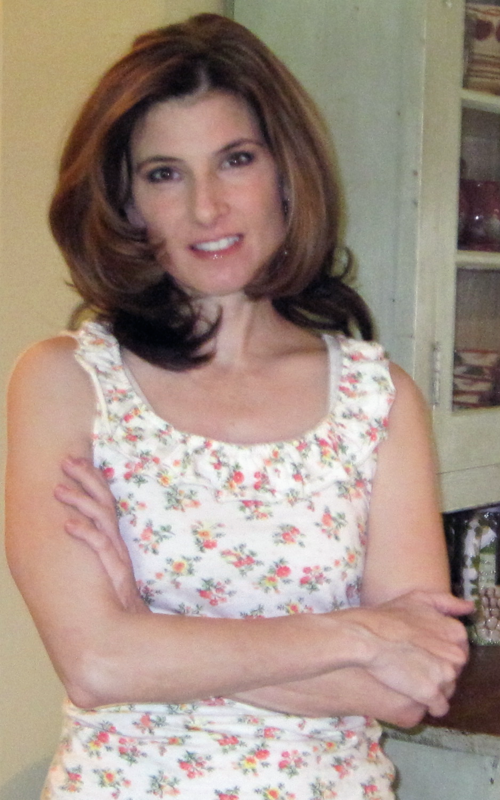 Kelly is also a mother of five, homeschooler, NASA enthusiast, and NFL fan. This book is the result of extensive research and years of experience helping patients one on one, while facing the challenges of living with rheumatoid disease myself. To bring you this exclusive investigation of the effects of rheumatoid disease beyond the joints, I read hundreds more research articles and scientific studies. As a result, I have a unique perspective to tell you the story that has never been told before, making this an exceptional book that finally sets the record straight. This is the first book to ever document that rheumatoid disease (or RA) is not a type of arthritis – and that it is typical to be afflicted beyond one’s joints. It warns both patients and doctors of specific dangers to address. Almost 600 footnotes. 250 pages. No fluff. This book is worth at least as much as any textbook – usually costing over a hundred dollars. I want to get this information in the hands of as many people as possible. That’s why I’m offering the book exclusively on Amazon first – to take advantage of opportunities to offer you the best possible discounts. It’s important to me to help our community and reward long-term readers with extreme discounts as we “launch” the book very soon. Yes, Kindle eBooks can be read on any device including your laptop or your phone. YES! There will be a paperback version (& more) as soon as the formatting is finished. But if you need this info, please don’t wait on my joints. Yes. There are some long words in the research in this book. But it’s a must-have one-of-a-kind reference book to fight RD. Don’t let big words – or anyone else – intimidate you from taking care of yourself. If I can manage to write this book, then I believe in you that you are clever enough to read it! 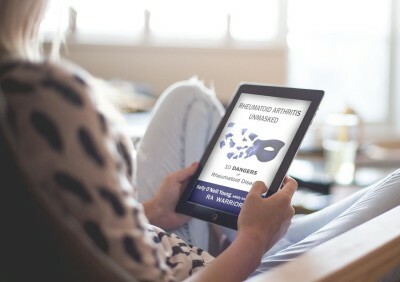 The Kindle version of Rheumatoid Arthritis Unmasked is already available on Amazon, as you’ll see when you click. 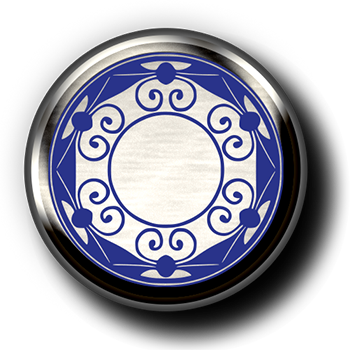 It’s scheduled to be released October 26th, but I plan to make sure it’s ready sooner. Sign up for emails below to stay up to date. Be the first to know about new articles, tools and special offers. I promise not to spam you or give your information to anyone.